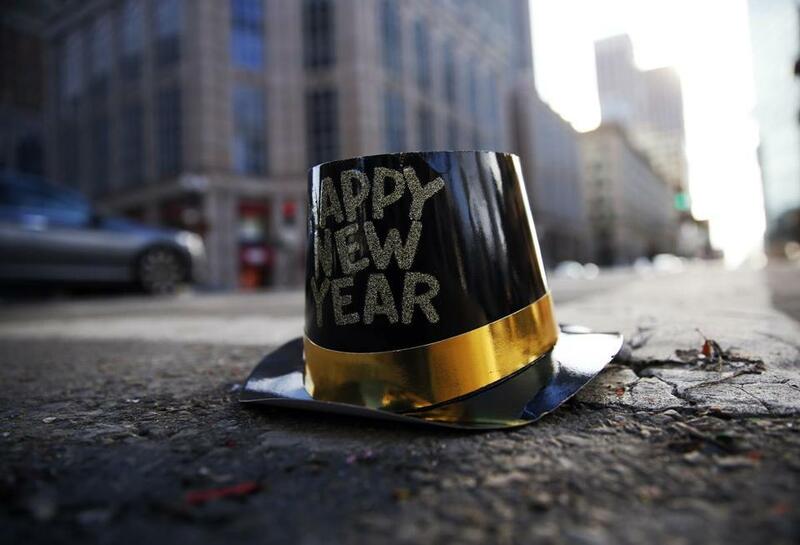 A hat from the previous night&apos;s celebration lays on Boylston Street on New Years Day. Liz, 68, who lives in Brigham Circle, dreams of cleaner sidewalks in the coming year. Patty, a 49-year-old resident of Back Bay, hopes for more investment in the city’s arts scene. Troy, 44, homeless since Halloween, seeks something simpler in 2016: respectful treatment of all people. Bostonians interviewed across the city Friday had no shortage of ideas for making life in Boston better in the year ahead. Many said their greatest hope is peace — but they also pine for simpler things: trains that run on time, sidewalks cleared of snow, and an adequate supply of parking spaces. A few hundred yards away in Franklin Square park, Miguel Martinez sat on a bench, smiling in spite of the bitter wind. He said he has struggled with mental illness, and with homelessness, and he hopes the city will do more this year to help people like him. He also hopes for something the city can’t provide: a research breakthrough that will lead to better treatments, pills to ease his symptoms without crippling side effects. 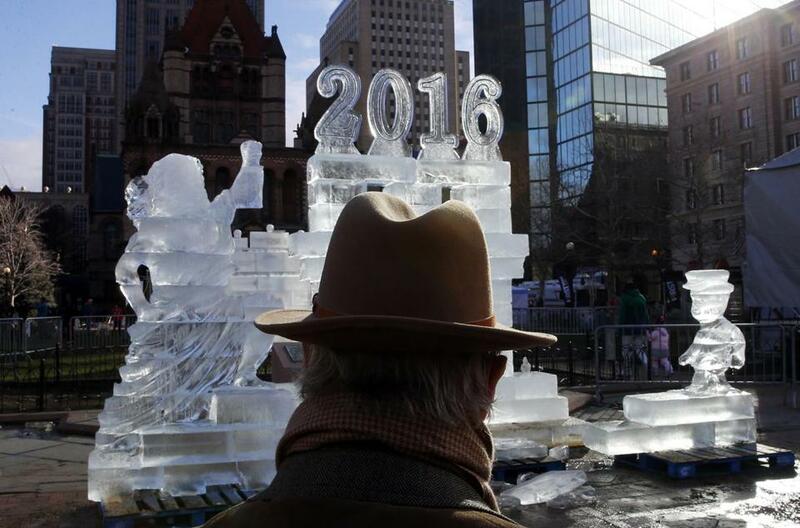 A man pauses to look at an ice sculpture in Copley Square on New Years Day in Boston, Massachusetts. The city’s First Night celebration continued in Copley Square on Friday, with ice sculptures on display and live music onstage, but Aliulino Cruz, 35, standing outside, was focused on the scratch ticket in his hand. His real hope was not for the millions it offered, he said, but for a year when the city will create more jobs. On the steps of a Roxbury mosque, the Islamic Society of Boston Cultural Center, two teenage girls answered quickly when asked their hopes for the coming year. Waiting at a bus stop on Huntington Avenue, a 35-year-old single mother named Jessica said she hopes the government will provide more oversight for low-income housing. Abuse of the Section 8 rental program is rampant, she said, and it spreads resources thin, leaving few options for her and her 15-month-old daughter while she works full-time and goes to school. “The system is broken, but it could be fixed,” she said, pulling pink mittens onto the baby’s hands. Jose Burgos and Tracy Smith don’t see their needs as insurmountable, either. The homeless couple spent the last night of 2015 sleeping in a doorway in Roxbury, as they have for years, but they hope to find a place to live this year. Smith, 47, said she was diagnosed with cancer this summer and given a year to live. She left the warmth of the hospital a month ago to be with Burgos, her partner of 25 years, she said. Standing together on Dudley Street, next to the shopping cart where they stash their blankets, they said they are grateful to be together. Jenna Russell can be reached at jenna-.russell@globe.com. Follow her on Twitter @jrussglobe.